Get Started // You will find information on digital manufacturing technologies and materials, tips, tricks, and other how-to’s that lower costs, accelerate timelines, and achieve the best possible results! FATHOM is more than just a 3D printing focused company. From advanced prototype fabrication to bridge-to-production services, FATHOM also offers CNC machining, injection molding, urethane casting, and 3D scanning. Speak with a FATHOM specialist to learn more. Speak with a FATHOM specialist to learn more about how FATHOM is uniquely blending 3D printing with legacy manufacturing methods so companies can go from concept to prototype to manufacturing in a way that wasn’t previously possible. FATHOM Brochure Quick guide on all services offered. 3D Printing Material Datasheet View more information about materials. Model Finishing Services Sanding, priming, painting, and more. Matte Vs Glossy (PolyJet) Guide on why to choose matte or glossy when ordering a PolyJet part. SolidWorks for Multi-Material Guidelines and best practices for using SolidWorks to generate multi-material 3D printed parts — includes simulated overmolding. Explore FATHOM Blog Learn more about additive technologies and enhanced traditional manufacturing. From smooth surfaces to thin walls to complex geometries to rigid to flexible — a variety of material options are available on FATHOM to meet your application needs. An overview of 3D printing and additive manufacturing technologies available at FATHOM’s Oakland and Seattle advanced production centers. We're committed to the work that it takes to offer everything advanced manufacturing. Check out our video library to learn more about technologies, materials, and application examples. 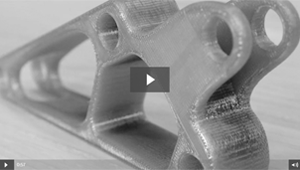 Adjust STL export settings for high quality to ensure better accuracy and smoother curves. please include clear instructions in the comments box and a FATHOM specialist will follow-up with you to discuss. All features are dependent on geometry and subject to review by a FATHOM specialist. Be sure to include “sparse fill” in the comments section and a FATHOM specialist will follow-up. This will prevent material from fusing together during the 3D printing process. For larger parts, or where surface finish is less of a concern versus strength or durability, FDM is ideal. Stereolithography and CNC machining should both be considered.